Our nation has undergone vast changes during the past sixty years, and so too has the concert band music written during those years. The repertory from the mid-1950s to today reflects the social and political customs of each decade. As the customs have evolved, so too has the music, architecture, art, and cinema. This article concentrates on the evolution of concert band music, and briefly comments on parallels in cinema, but omits the evolution in architecture and art. If you are planning to bring these disciplines into your teaching, the sidebar (on page 27) will guide you to the identification of seminal works. Let’s begin with the 1950s-the decade of determination. The United States had come out of World War II as a world power, our economy was strong, the population was growing, but at the same time, the new threats of the Cold War and of the Space Race brought about a prevailing undertone of worry and uneasiness in day-to-day life. As counterpoint to the worry, this was also the decade of Futurism. Possibilities were limitless. Modernism would solve all of our woes. You can see this bipartite vision in the music and cinema of the decade. The optimism of futurism balanced with atomic-era fears. It is no wonder, therefore, that the rash of bipartite band compositions from this era, such asChorale and Alleluia and Dance and Intermezzo, would prove so effective that composers would continue to rely on the two-part form for decades to come: Chorale and Shaker Dance.There’s even a band arrangement from this era entitled Prelude and Hula! Despite all the optimism of futurism and of the modernism that would define the 1950s, the overriding concerns over the Cold War and the Space Race brought a damper to the otherwise unbridled enthusiasm of this decade. And we see this concern reflected in cinema in remarkable ways. Consider the fact that movies such as Creature from the Black Lagoon, The Day the Earth Stood Still, and Vertigo, were all statements about the fear of the unknown and the ominous danger that was present beyond our own borders. Clifton Williams’ Fanfare and Allegro is a befitting example of 1950s band music. The two-part form is commonplace from this time period. But even more profoundly, it reflects the emergence of the concert band from an entertainment medium (for which it had been largely know prior to the ’50s) into an artistic medium. The band was now destined for a new future. And this futurism is found in compositions such as Fanfare and Allegro, among the first to elevate the compositional craft above that found in a typical school band work. repertory. To our ears today, the orchestration, the melodic treatment, and the harmonic language of this music all scream “the 1950s!” and while it still has the freshness and power of the movies above, it shows its age. It is a seminal work that has helped bring us to where we are today. It is authentic: This is the real thing, fresh as the day it burst upon the scene. It’s not an imitation of the ’50s – it is the 1950s embodied. The 1960s was a decade which largely rejected the old and sought the new. It was also the decade of a new interest in the global community. It was the decade of preemptive political war, the decade of the United Nations, and the decade that brought to us lunar spaceflight, which revealed just how small our planet is and how close our populations live regardless of political borders. The 1960s was indeed the decade of a new world order. It was the decade of Internationalism. You can see this vision of a new world order breaking down familiar political borders in movies such as 2001: A Space Odyssey, Dr. Zhivago, and Planet of The Apes. A new surge takes place in the both quality and ambition of compositional craft found in most band works. Variations on a Korean Folk Song by John Barnes Chance is not simply a reflection of ’60s-era internationalism. It is also a fine example of the new quality of composition – compositions completely accessible by school bands — that came to flourish in this decade. The concert band genre was riding a wave of newfound prestige. And then came the 1970s… the “Me Generation”… the decade that would attempt to stave off the gloom of an economy in a new kind of recession with both inflation and economic stagnation (dubbed “stagflation”) … a war that divided families, and a presidency that scandalized a nation. Big, over-the-top, outlandish… yet impersonal, selfish, alone. For all of the glamour, excitement, and spectacle of the disco scene, there was also indescribable loneliness, self-doubt, and self-destruction. In the ’70s one could be surrounded on the dance floor by hundreds of gyrating bodies, but you often felt utterly ignored and completely alone. We were so occupied to have a good time, it seemed as though we weren’t too aware of taking time to bring good to others. The pervasive themes of the 1970s: Feeling loneliness, self-destructive indulgence, and a gloomy fear. ‘70s era composers were ready to let their audiences feel equally alienated. Just like in the other arts, in the 1970s band music takes a decidedly new direction. There was a tremendous output of new music for band in this decade – art music for the sake of art. But much of this music was received as being impersonal, selfish, and distancing. Audiences were alienated by this new music. This new style of band music may very well have been genuine, heartfelt, and profound; and many performers, conductors, and audiences would readily accept that this new music was, indeed, artistic. But to many, it seemed that composers did not care if anyone was listening. Perhaps John Paulson’s intent when he composed Epinicion for band was to make his audience, through music, think about the horror of war. Published three years before the end of the Vietnam War, his very modern epinicion (historically, an ancient Greek victory song but there is no victory here) epitomizes this volatile, lonely, gloomy decade of the ’70s. His music makes a powerful statement and employs incredible orchestration; at the same time Epinicion is lonely, destitute, and alienating music. The “Big 1980s!” If the ‘70s was the “Me Generation,”then the ’80s was the decade of pure self-indulgence. Bigger, brighter, louder, faster…. More “special.” And consider the self-indulgence portrayed in such popular movies of this decade as Fast Times at Ridgemont High, Ferris Bueller’s Day Off, and St. Elmo’s Fire. So imagine how shocked, how stunned the audience (entirely of college band directors) responded to the premiere performance of David Maslanka’s Symphony No. 2 in 1987 at the College Band Directors National Association’s national convention held at Northwestern University. (Now if there was ever a gentlemen’s club profession in the ’80s, it was certainly such among college band directors.) Mossy band directors heard a band work unlike any other known at the time! This minimalist-influenced, gargantuan work electrified the profession. It was big in scale, physically taxing, kinetic in tempo, driving in rhythm. It spawned a whole new generation of composers to write for the biggest concert band … for the symphonic wind ensemble. Maslanka’s symphony was (and I say it in this fashion to parody every ’80s-era sitcom television show): Maslanka’s symphony was a “very special episode of band music. And it was electrifying! Now I must close my script, because there is no history yet for our remaining decades: the 1990s and our initial years into the 21st century. There has been too little time … not enough time has passed to make history yet. Our commentary on these recent decades will not be history; it will be sociology at best. We do not know yet what will be recognized as the predominant themes in the arts and culture from the 1990s to the present. But we can certainly conjecture now what some of the likely themes for these decades will be – and they are humor in the ’90’s and what I call excursionism (or escapism) in the ’00’s. As to humor: Eric Whitacre’s Godzilla Eats Las Vegas! is an example of farce; Robert Sheldon’s A Longford Legend is fantasy; Andrew Rindfleisch’s The Light Fantastic is parody; and Rob Deemer’s Carnival of Dreams is a perfect example of slapstick. With ’90s-era humor came what I describe as a lack of vigilance, or a sense complacency. This is tragically recalled in our thoughts of September 11, 2001. But even before that dark day of history we see already in cinema movies that reveal in our psyche that sense of complacency and a lack of vigilance. Movies such as Apollo 13, Jurassic Park, and Titanic: movies depicting actions left unquestioned; actions which harkened Robert Oppenheimer’s charge, just because we can do this, should we? And from the disastrous results from complacency we find in art the reaction of running away, or trying to get away. You don’t necessarily know where you are trying to go you just want to get away. Run away as fast as you can, as frantically as you can. Look at the movies that came out in just the first few years of the 21st Century, all of them have permeating themes of running away, sometimes with purpose, and often time with none: Catch Me If You Can, The Fast and The Furious, Finding Nemo. In the 21st century, band music has been scattershot with excursion or escapism compositions: Windsprints, Persistence, Whirlwind(s), Full Tilt, INTO THE CLOUDS! (all five by Richard Saucedo),Rush (Samuel Hazo), Turbine (John Mackey), Spin Cycle, Recoil (Joseph Schwantner), Slalom (Carter Pann), Shortcut Home (Dana Wilson), The Red Machine (Peter Graham). All of them compositions with constant fast driving rhythm and speed. All going somewhere, but not necessarily having a prescribed destination. They are works of speed to go, but not necessarily works of speed to arrive. Excursions just to get away. Will excursionism or escapism be remembered as the predominant compositional style in both band music and all of the arts in the early oughts? Only time will tell. But no doubt in the band realm, these types of compositions are the mainstay found in today’s publisher’s catalogs. We treasure cinematic masterworks that epitomize the attitudes, politics, and mores of their generation. And from the richness of the wind ensemble’s repertory we discover that our finest works from the band repertory, too, communicate the attitudes, politics, and mores of their generation. It is true that the band medium does not often garner the same level of recognition and even respect that our colleagues find with orchestral music and choral music. 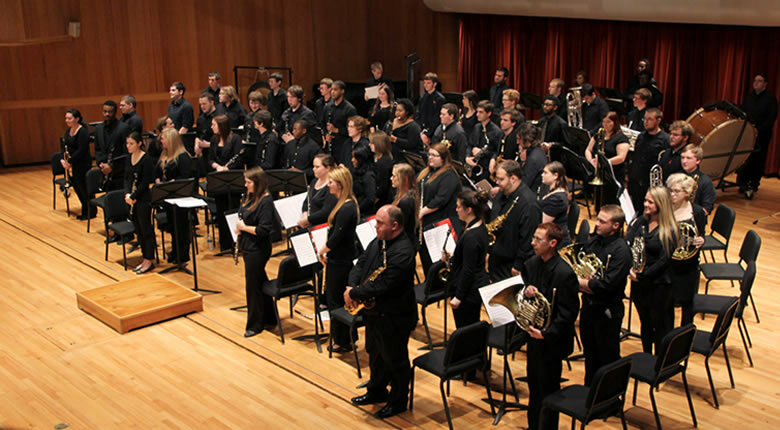 It is true that the concert band is not as conspicuous in the professional musicians’ world because in our society the band is largely situated in our nation’s academic realm. But it is an unequivocal truth that band music matters. It matters because it is meaningful; it is timely; it is artistic; it is pertinent; it is profound. Band music communicates, explains, reveals, and provides purpose and meaning to our everyday lives. And band music will continue to do so because it is and I hope always will be music of human experience. What does a Band Director really need to know about the saxophone and emergency repair?